Poetry is a concise and elemental means of expressing the deepest of human emotions: joy, sorrow, grief, hope, love, and longing. It connects us as a people and a community; it speaks for us in a way few other forms of writing can do. When I was in the process of moving to Manhattan in 2001, in the weeks after 9/11, poems appeared on every available wall in the city. Yet even though I was so aware of poetry’s power, over the next ten years, while sitting alone in front of my computer, finishing up another volume in my Ten Poems series, I would wonder at times whether I was wasting my time. After all, the world is in trouble. It has always been in trouble. Not only that, but we are often in trouble personally, too. Surely there must be something more useful, more pressing, to give my time to than reflecting on poetry? Couldn’t I go start a project in Africa, or at least do some small thing to prevent climate catastrophe, start reducing my own carbon footprint, for example, and begin a movement to encourage others to do the same? But no; I wrote more poetry books, wondering all the while whether they and I were doing little more than making ourselves progressively irrelevant. I knew better, which is why I kept writing. I knew that great poetry has the power to start a fire in a person’s life. It can alter the way we see ourselves. It can change the way we see the world. You may never have read a poem in your life, and yet you can pick up a volume, open it to any page, and suddenly find yourself blown into a world full of awe, dread, wonder, marvel, deep sorrow, and joy. Poetry not only matters; it is profoundly necessary. Especially in times of darkness and difficulty, both personal and collective. To read or write poetry is a powerful, even subversive, act, and it is one small thing we can do that can make a very big difference. It can make a difference because at its best poetry calls forth our deep Being, bids us to live by its promptings. It dares us to break free from the safe strategies of the cautious mind, from our default attitudes and beliefs. It calls to us, like the wild geese, as Mary Oliver would say, from an open sky. It is a magical art, and always has been — a making of language spells designed to open our eyes, open our doors, and welcome us into a bigger world, one of possibilities we may never have dreamed of. This is also why poetry can be dangerous: we may never be the same again after reading a poem that speaks to our own life directly. I know that when I meet my own life in a great poem, I feel opened, clarified, confirmed, somehow, in what I always sensed was true but had no words for. Anything that can do this is surely necessary for the fullness of a human life. The word poet means a “maker” — someone who crafts language into a shape. The word maker has the same etymological root as the words matrix, and magic, and it’s true that the sound, the rhythm, of good poetry is literally spellbinding. It lulls, it sways, it rises and falls, and our hearts and minds rise and fall along with it. Poetry literally entrains us into the energy, the mood, the vibration, even, that the poet conjures with her words and images. The subtler and more refined that energy is, the more it can raise us to the best that we are. That it does so is another reason poetry is so necessary today, when we need our best selves more than ever. 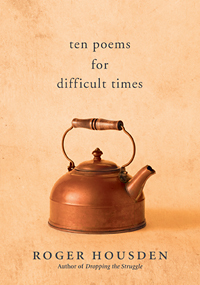 Roger Housden is the author of the new book Ten Poems for Difficult Times, the most recent addition to his bestselling Ten Poems series, which began in 2001 with Ten Poems to Change Your Life. He offers writing workshops, both live and online, with an emphasis on self-discovery and exploration. Visit him online at www.RogerHousden.com. Excerpted from the book Ten Poems for Difficult Times. Copyright © 2018 by Roger Housden.